The disc contains five compositions, two of them being re-recordings of well-known tracks. Notably, the title track is a new composition, though (by unknown reason) the same title had been used for the composition Brain Offender on the Astoria Theatre London single back in 2003. Vernal Rapture had been available for download exclusively from the TD Online Club since 2009 and was released to the public for the first time now. The Eastgate Music Shop about the CD release "The Gate Of Saturn is a new production out of Eastgate's CUPDISC series. 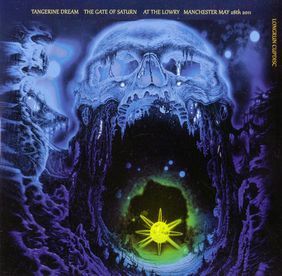 On the occassion of Tangerine Dream's Manchester concert at The Lowry on May 28th, the TD fans will get some brand-new sounds and tunes -- including the new track The Gate Of Saturn -- as well as the very popular composition Vernal Rapture, a track which could be heard so far only by members of the TDOC (Tangerine Dream Online Club). There will be only about 1500 CDs manufactured -- so it is pretty obvious that this one will become a collector's item very soon. Enjoy this special disc!!" Only a few days after the CD release this album became available as MP3 download at the Tangerine Dream Download Shop as well.